Hailing from San Francisco, The Living mesh styles as diverse as Metal, Shoe Gaze and Pop into an emotional witches brew that they make all their own. 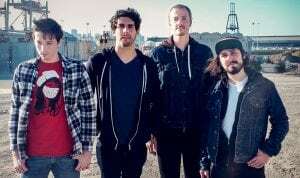 Made up of long time friends Derek Barnes (vocals/guitar), Julian Balestrieri (guitar), Jeremy Shepherd (bass) and Jason Zaru (drums) their sound is raw, emotional and heartfelt. Their self-released self-titled debut is available now. 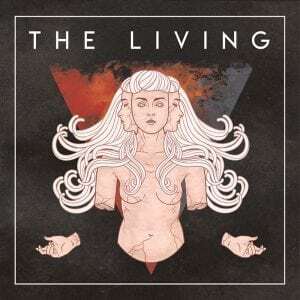 The Living is the kind of band where guitar solos count for a lot, maybe even everything. They spin them and stretch them and shift them into the fabric of their music, propelling the songs to dizzying heights. And we’re talking your better class of guitar solo here, the kind where the number of notes played is less but every note counts for more, and that are so melodic that they stick in your ears like caramel on a taffy apple. The track “Deceiver” is a great example of how The Living like to work at song structure. Things start at a slow burn with a simple guitar riff and build slowly by adding shades, textures and dynamics until they reach a full boil, which is (you guessed it) a pretty spectacular guitar workout. Album closer “Headless Pillow” is a real highlight and again works the quiet/loud/quiet songwriting dynamic perfectly with vocalist Barnes singing the opening verses in a whisper before the band kicks in and the guitars start wailing. The last five minutes of this seven minute epic is a breathtaking rush of guitar virtuosity, as melody after melody effortlessly spin off the fret board and the song rushes headlong towards the finish line. But not before the band masterfully drop the bottom out of the song like a perfectly thrown curveball in game seven of the World Series – and it ends in a whisper. Beautifully done. The Living may just be a perfect fit for fans of groups like My Sleeping Karma or Mogwai, two mostly instrumental bands whose sound The Living build on by adding vocals into the mix. And judging from the sound of their album, which is well produced but also very live sounding, I’m betting these guys put on one hell of a gig. Smart money is on catching them live when they come to your town to play.